I am totally in love with my new hair!! I am always very happy to come to Dry and Fly! Natasha, Nicole and all the girls are super!! Highly recommended!! Excellent 5 star Service...really felt pampered ....beautiful salon...very professional manager and staff and wonderful products used. Thank you very much. I'll be back. Had a brilliant blow dry by Danielle. My hair is long and can take a while to blow dry but Danielle was brilliant and so quick. Together with the lovely touch of prosecco had a lovely and relaxing time. Highly recommend! Love the blowout! I am here in Ireland and the water pressure in my hotel would not wash the shampoo out of my hair soooooo I decided to get a blowout (with shampoo). It was awesome and less expense than in the US ;-). Definitely would do it again!!! 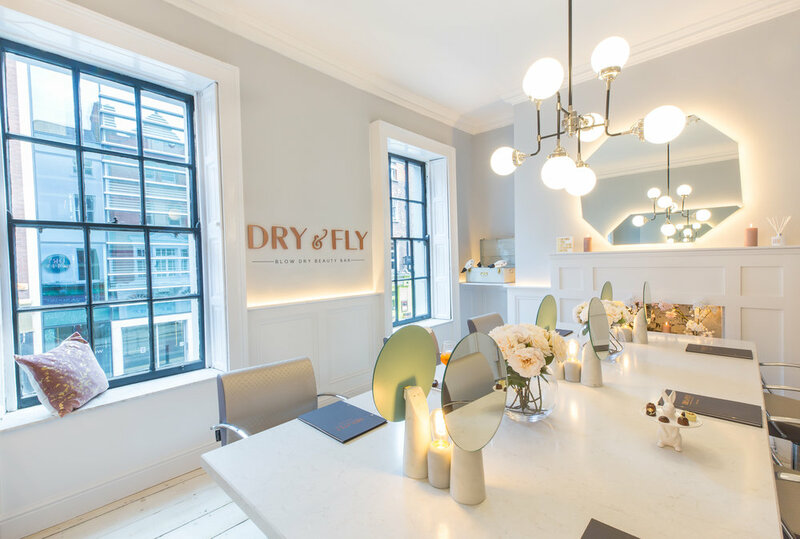 This was my first time to visit the Dry & Fly on Merrion Row. I thoroughly enjoyed my visit and I will most definitely be returning again. Laura was extremely nice, and she totally understood the blow-dry I wanted and the look I was trying to achieve. She pulled out all the stops and I had a great chat and giggle with her, which I really enjoyed, in such a relaxed atmosphere also. Already looking forward to my next visit. The best blow dry I have had in years. It seemed effortless to achieve the look I had asked for. Great products. Relaxing environment. I will definitely be back. Such a nice experience today in Dry and Fly! Absolutely gorgeous salon! Nicole was so lovely and helpful, totally put my mind at ease about trying Goldfever extensions. Can't wait to go back! Laura was great. So friendly and made me feel very comfortable and looked after me the whole time. My color is the best color I’ve ever had along with the blow dry. I’ll be coming here from now on thanks so much! Thank you for a wonderful experience yesterday. The cut and color is amazing, Nicole is very knowledgeable and also a lovely person. The salon itself is beautiful and it really is a treat to be in with you. Thanks a mill. So happy with my highlights and freshly cut hair thank you Nicole you did a fab. Job! I love visiting Dry and Fly, Natasha is excellent. This place is a gem � so happy I discovered it, it is located in the heart of Dublin, and it is the perfect stop before a night out, they will finish your look styling your hair to fabulous at the time of a prosecco glass...20min max and you are out. Myself and 6 of the girls started our Saturday in Dry and fly Wicklow St. It was a birthday surprise for one of the girls and she loved it. The staff were so relaxed, friendly, and served everyone a drink!! Would definitely recommend for a girls day, or just to treat yourself! Will be back for sure!! I arrived on a Friday morning without appointment (was really trying my luck there) and was promptly welcomed by the very friendly staff and Alison was my assigned stylist. I had a wash and blow dry, the products smelled heavenly, I had a coffee, but there’s a also a choice of tea or Prosecco. The place has great a atmosphere and and the stylist makes you feel very much at home. Will definitely be back and recommend to my friends. Oh and my hair looks fab! Had one of the best experiences I’ve ever had in a salon today. My first time in dry and fly! The salon is beautiful, Nicole was professional and absolutely lovely and made my whole time there so enjoyable. Most of all it’s the happiest I’ve ever been with a blow dry! Can’t wait to come back!